LG 100 inch Laser TV | What is Laser TV? It’s exciting, it’s in Australia and it is HUGE! The product’s full name is the LG Laser DLP Display. Essentially, it uses technology called ultra-short throw which grabs the image and projects it onto the screen within 55cm, rather than from a projector at the back of a room. The image is projected through 10 spherical lenses before passing it through an aspherical concave mirror to be thrown onto the display screen itself. It’s a 100-inch full-HD 1080p image, chucked from a projector which sits at the base of the black, anti-contrast, anti-glare screen. How Does Laser TV Work? 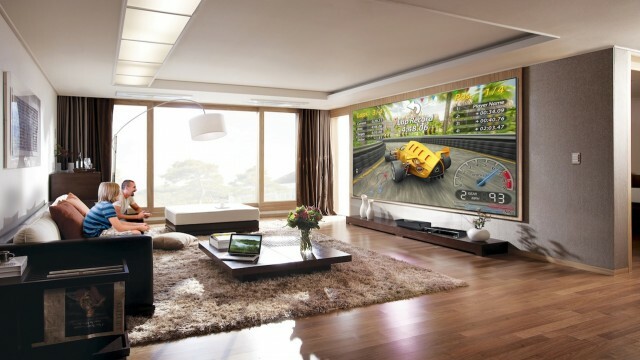 The Screen itself is slick and stylish, and is mounted to the wall itself. 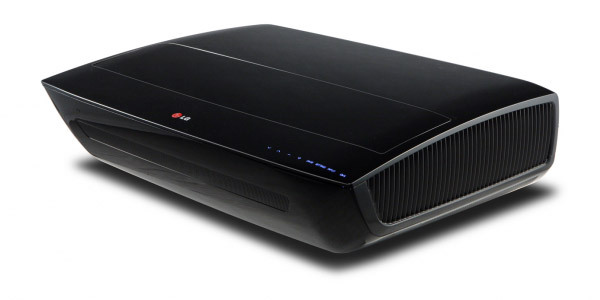 The actual projector will sit on your cabinet in front of the screen, and is attached to a 1TB Twin HD Recorder/Bluray Player (amazing on its own!). Connect any other devices you wish into this Twin Tuner Recorder, then sit back and enjoy! The compact projector component is very stylish! Very impressive 100 inch screen; the size is the same as four 50″ Plasmas stacked together! The lamp is also considerably impressive: with other projectors, you’d need to replace it every couple of years. LG promises that the lamp in the DLP Laser Display will go for 25,000 hours. That’s five hours per day for 13 years. Not bad at all. The Laser TV screen that the projector throws the image onto is actually made from anti-glare material, which means that you won’t need to dim the lights entirely to have a high-contrast viewing experience. The screen is also black rather than silver to help dissipate light reflection when viewing. The screen also has a tiny bezel that disappears into the background when the images play. Bundled with a 1TB Twin Tuner Recorder, this package is complete for less than $8949 (considerably less than the $10,000+ you can expect to pay for a similar sized Plasma). 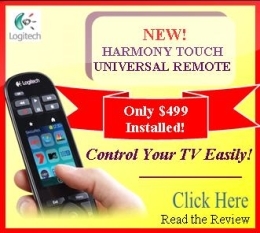 If you are looking for a super large screen but which works just like a normal television (with easy remote controls and connectivity) then this LG Laser is exactly right for you. The Twin Tuner becomes your connection HUB; with 3 HDMI inputs, you can connect your laptop, your Foxtel and the kids Playstation 4. 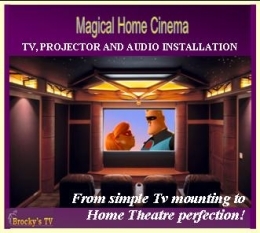 Installation is considerably less than an actual projector with no cables required to be installed inside the wall; the screen is completely separate from the devices that do all the work. It’s plug and play (with a little training on how to get the most out of it all). The Full HD 1080p resolution is excellent (DLP technology is a smooth image, and although it’s not 4K, it is exceptional quality for a 100″ screen. Sport, movies, games and TV will all be worthy of a ‘show-off’ session to your mates! Lastly, this picture is huge! Sit back and enjoy cinema size and quality in your very own lounge room! 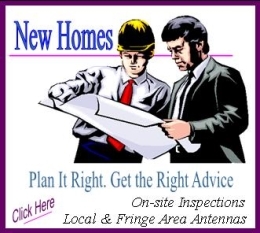 For supply and installation of a Laser TV on the Sunshine Coast and Gold Coast, please contact us on 1800 588 688 or click Here to find out more. Let us take care of the installation so you can take care of the enjoyment!